Hi! It's Tonja again… and thanks to a bunch of people posting on Facebook (and Nom Nom Paleo praising the machine itself), I went and purchased an Instant Pot on Amazon during a 24-hour sale a couple of weeks ago. My main reasoning for purchasing was the idea of bone broth in less than 2 hours (and without stinking up my house for 2 day - maybe the bigger reason). But when I saw all the things this little machine could do, I was even more excited. I've never been a huge yogurt fan, but the boyfriend is. So when I told him I was going to be attempting a yogurt recipe he was pretty excited. And now that I've nailed it, I wanted to make sure to get it out to all of you who purchased the Instant Pot too. 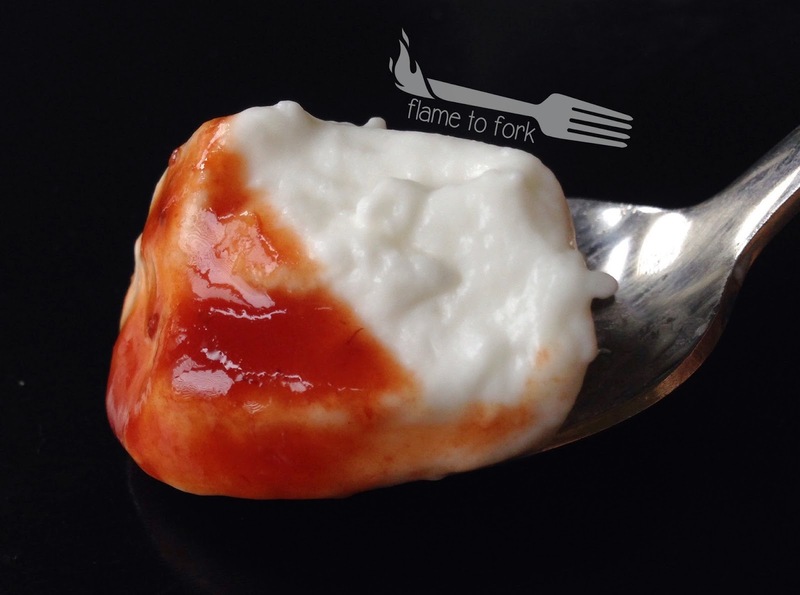 If you haven't, I get there are other ways to make yogurt with your oven, etc. But obviously this makes the process a lot easier, otherwise I would have tried those other recipes. Also, DISCLAIMER: I've have only tried it with the exact ingredients I link to in the ingredients list. I'm aware there are a million types of probiotics and coconut creams out there, but if you use those, do so at your own risk. I have absolutely no experience with them with this recipe. Again, all products are linked in the ingredients list. * It's possible other probiotics will work just as well, but for comparison purposes, I used 50 billion CFUs. If you use another brand, just make sure it is stored in the refrigerator. This brand is highly recommended by my functional medicine doctor and I alternate in taking this as a supplement every night with my Prescript-Assist so my body doesn't form any sensitivities to either one. The basic instructions for making the yogurt are on page 16 of your 7-in-1 Instant Pot manual. you start this recipe. Starting in the morning to finish at night is ideal. Plug in your Instan Pot and pour the well-shaken carton of coconut milk into the metal reservoir. Close and seal the lid and hit "yogurt" and then the "adjust" button so the display now says "boil". I am not sure this step is necessary since we are using coconut milk from a sealed container, but the idea is to boil/scald the milk to kill any other bacteria that could inhibit the growth of the good stuff we'll be putting in to sour the milk. Once it has cooled, empty both the probiotic capsules into the milk and whisk to combine well. Return the metal reservoir back to the machine, close and seal the lid and hit the "yogurt" button again. This time you'll want to use the "+" button just below the display to set the time to 12 hours. It's possible it could be done anywhere from 8-12 hours, but my yogurt came out with a nice amount of tartness with 12 hours. When the machine beeps to signal the 12 hours is up, make sure to taste the coconut milk to ensure it is tart. In ONE trial run, it still just tasted like plain coconut milk. I had entrusted the boyfriend to put the probiotics in and I am still not sure what he did. He swears he used the right ones and put 2 capsules in - we will never know! If for some reason it didn't work, add a couple more capsules, whisk to combine and set the machine for another 12 hours. It's possible some capsules just might be bad. If to your desired tartness, remove the metal reservoir from the machine, lightly sprinkle the gelatin over the top of the yogurt and whisk vigorously until the gelatin is well-combined and no visible lumps are seen. Pour into desired containers/bowls and let set in the fridge for several hours. I didn't keep track as to how long it took, but I do remember checking a few hours later and being worried it wouldn't thicken - it did :) Just be patient! Instead of serving with the sauce below, before refrigerating, add in your sweetener and flavors of choice: maple syrup, melted honey, coconut sugar, vanilla, etc. and make it your own! In a small saucepan over low heat, add in the strawberries and water and cook until melted down and very soft. Add in the balsamic vinegar and honey and continue to cook for about 15 minutes over medium. Either using an immersion blender or by pouring the contents into a blender, blend until smooth. Continue to cook over medium heat until thickened. Pour into a container and refrigerate until cool. Some of the links in the post above are “affiliate links.” This means if you click on the link and purchase the item, we will receive an affiliate commission. Regardless, we only recommend products or services we use personally and believe will add value to our readers. This money helps us continue to be able to offer support and services to you, our readers. Plus, it helps us keep our freezers fully stocked with bacon :) We all need bacon.